The search is OVER. I have now found the best, and I mean best, peanut butter oatmeal cookie recipe. Thank goodness that I found it on the second try. It beats Dorie's PB Oatmeal Chipsters by a mile. They are nice and crispy and peanut-buttery. I dare you to stop after eating just one. I found the recipe on the Allrecipes website. I absolutely love the site since you can find all sorts of recipes there with tons of reviews and ratings. This recipe, by the way, was a 5-star with 547 ratings. Yep, when there are that many good reviews, you simply can't go wrong. I opted to make them without the peanut butter filling. Although, sandwiching them together with chocolate or drizzling them with melted chocolate also sounds like a wonderful idea. Or putting chocolate chips in the batter. Yes, a little something extra would certainly not be scorned, but, they are amazing enough to stand on their own. Anything extra would simply be icing on the cake (or cookie as it were). I have only three words left to say about this cookie: THIS . . . . IS . . . . IT!!!!! Cream the butter with the peanut butter, sugars, and vanilla. Add egg. Combine flour, baking soda, baking powder, salt and oats. Add to the butter mixture. Drop by teaspoons onto a baking sheet and press each mound down to form 1/4" thick cookies. Bake at 350F for 10 min. or until cookies are firm to the touch. Combine the ingredients for the filling and spread onto half the cooled cookies. Top with the other cookies to form sandwiches. Note: I used Kroger brand crunchy peanut butter. I prefer this one because they use peanut halves rather than those tiny pieces of peanuts. But, your favorite brand of peanut butter will do. These bars are definitely deserving of their name. They are four layers of sweet, rich amazing goodness. Worthy of a special occasion, detrimental to your diet, heavenly on the tastebuds. Making these was a little time-consuming. After all, you have to prepare four different batters. At one point, I nearly mixed up the chocolate chip and chocolate batters since the base looked so much alike. So, labeling the bowls or using different type bowls for them would be a good idea. It was also a little difficult to layer the chocolate batter on top of the first cookie layer. It was very sticky and just did not want to spread nicely. Someone else said to freeze the cookie layers as you're doing it, so I might do that next time. I finally got them into the oven, all four layers, and then ran into another problem. The recipe said to bake them for 35-40 min., but at that point, the top chocolate chip cookie layer was still really gooey and doughy. So, after taking it out of the oven and trying unsuccessfully to slice the bars, I realized I'd better put them back into the oven. I must have baked them for at least 15-20 min. more before I was finally satisfied with the consistency. Upon slicing them, I was a little disappointed. My bars did NOT look like the ones in the picture. My peanut butter layer came out very thin, I could barely even see it. Jenny from Picky Palate (the creator of this wondrous dessert) suggested doubling the dough for that layer and that may solve my problem. I tasted the bars while they were still warm and the taste did not blow me away. I was a little worried, but, after chilling them in the fridge and giving the flavors time to meld, I took another taste. And . . . . they were SOOOOOOO GOOOOOOD. It's like eating a brownie married between cookie layers. They are extremely hefty though, so cutting them into small pieces is recommended. Hefty, or not though, I still had to drizzle them with some melted milk chocolate like Jenny did with hers. I took them to my ward's Cookies and Conversation. People loved them. They all commented on how rich they were, but nevertheless, very good. So, this recipe is most definitely a keeper. Line a 9x13 pan with foil. Press sugar cookie dough into the bottom of the pan. Combine ingredients for double chocolate chip cookie layer and press on top of the sugar cookie dough. 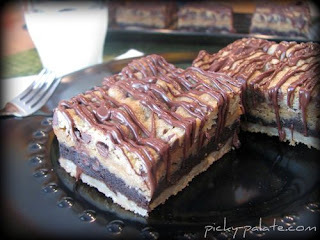 combine ingredients for peanut butter cookie layer and press on top of the chocolate dough. Combine ingredients for the chocolate chip cookie layer and spoon evenly over the peanut butter cookie dough, but do NOT press, just leave uneven. Bake 45-60 min. or until center of dough is cooked mostly through. Edges will be brown. You can cover the pan with foil during the last 15 min. of baking. Let cookies cool completely. Drizzle the top with melted chocolate, if desired.